Pope Francis has ordered a ban on the sale of cigarettes inside the Vatican from next year because of health concerns, a spokesman said on Thursday. A man smokes a cigarette in front of St. Peter Square, in Rome, Italy November 9, 2017. “The motive is very simple: the Holy See cannot be cooperating with a practice that is clearly harming the health of people,” said spokesman Greg Burke. He cited World Health Organization statistics that smoking causes more than seven million deaths worldwide every year. Cigarettes have been sold at a discounted price to Vatican employees and pensioners. 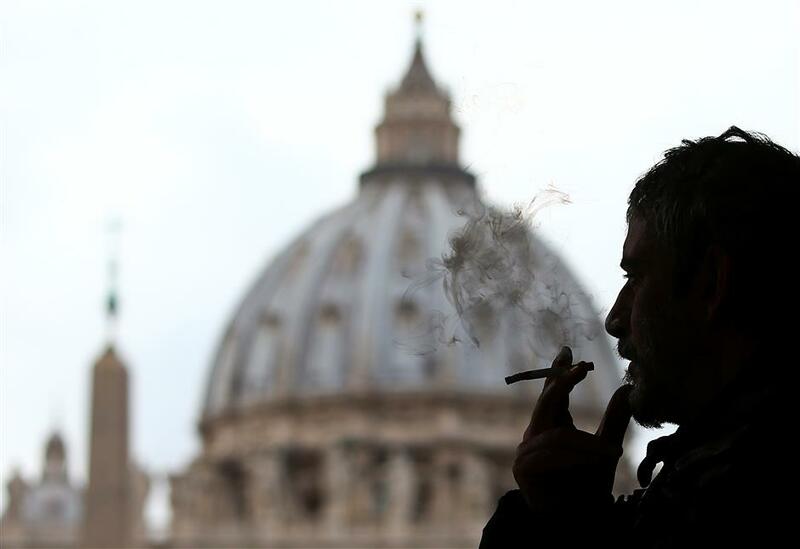 Vatican employees are allowed to buy five cartons of cigarettes a month. Many Italians ask their non-smoking friends who work in the Vatican to buy cigarettes for them because they cost much less than in Italy, where they are subject to heavy taxes. Burke acknowledged that the sale of cigarettes has been a source of revenue for the Holy See. “However, no profit can be legitimate if it is costing people their lives,” he said. The sale of large cigars would continue for the time being because the smoke is not inhaled, Burke said. The Vatican, a tiny walled city-state surrounded by Rome, is one of the few states to ban smoking. Bhutan banned the sale of tobacco in 2005.